At its 30th edition, this event will be dedicated to the younger generations. Primaveranda will begin on April 24 and go on until May 1 with a rich panel of entertainment, workshops for the kids, markets and much more. The food stand "dalla terra alla tavola" will allow the visitors to enjoy some traditional food. 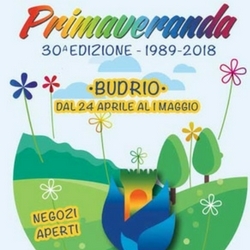 A great celebration dedicated to springtime, featuring a series of sport events, concerts, exhibitions and shows welcomes the visitors to Budrio with a scent of spring.